Built in 1829 with castle-like walls and imposing guard towers, Eastern State Penitentiary in Philadelphia, Penn. was the first prison to institute solitary confinement. Prisoners lived alone, ate alone, and even exercised alone in individual yards. When an inmate left his cell, a guard covered his head with a hood so that he remained in confinement. Although the solitary system was quickly discarded due to overcrowding, Eastern State is widely believed to have caused mental illness among its prisoners. It operated as a regular prison from 1913 until it closed in 1970, during which time it housed both Al Capone and bank robber Willie Sutton. The prison was abandoned in 1971, and rumors of strange happenings have plagued the stone penitentiary ever since. 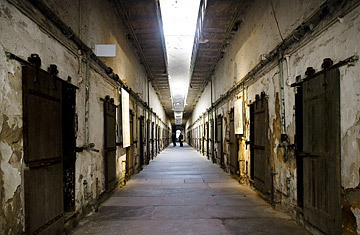 Visitors to the prisonand there are many, for Eastern State is now a museum and Halloween haunted housereport footsteps in the yards, the sound of someone pacing in the cells, eerie noises, and lonely wails that drift through the cold, dark corridors. Cell Block 12 is famous for its disembodied laughter, and one guard tower appears, on some nights, to be occupied by a shadowy figure keeping watch over the empty prison.